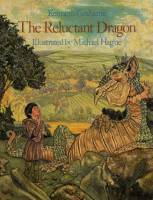 A week or so back we read The Reluctant Dragon , by Kenneth Grahame, in conjunction with our emphasis on knights, castles and dragons this fall season. We broke the book up into two days worth of very fun reading. I thought the book might be a bit over the boys' heads but I need not have worried. If you make a book sound interesting and provide hand motions and body language which help tell the story, that can help you get past a large vocabulary word or two. It tells the story of a boy who befriends a poetry loving dragon in a local cave. When the people in the village discover there is a dragon in the cave, St. George the knight is called upon to fight the dragon. The boy arranges a mock fight between St. George and the Dragon, neither of whom are terribly interested in fighting but they must in order to Follow the Rules. The Reluctant Dragon was originally published in 1898. It originally appeared as a chapter in Grahame's book, Dream Days. The story is set in Oxfordshire, where legend has it that St. George actually did fight a dragon. John Rutter turned this story into a children's operetta. I was rather surprised by the character of the boy in this book. I realize that I should not be surprised that there are discrepancies between the Disney film and the original story but, nevertheless, I was taken aback by the fact that the boy is treated as an equal by his parents on account of the fact that he enjoyed his "book learnin'". Due to the fact that the boy is immediately introduced as an equal, I couldn't help but compare him to Eustace Scrubb as I read along. I never did learn to like the boy very much. He was cocky and arrogant and a bit too big for his britches. If he were real, I wouldn't be able to stand him. I mostly enjoyed the character of the dragon for his ridiculous behaviors. I made a lot of huff and bother over the dragon and painted him out to be a big silly creature, so much so that I got a lot of laughs and chuckles from the boys. We all enjoyed the read as a whole and, given their current ages (5 and 2), the issue of the boy being his parents' equal went right over their heads. When they are a bit older we'll tackle that topic. For now, we simply enjoyed a story about a silly dragon who didn't like to fight. Fun reading times. We'll keep this story fresh in our minds with the Disney version but we will revisit this classic again in the future. It's worth the time. You know, I remember that about the boy! I'm glad this one was a hit at your house! Somehow I missed both the book and the film, regretfully. My boys would have loved them. You know, I'm not sure we actually read this one either -- though I remember the physical book very clearly from the library, I don't think we got around to reading it. Your review makes me think it's high time! Thanks for the snack tip too: banana chips and chocolate chips. Yum!